The first inhabitants of the town of Dornoch arrived 3000 years ago, followed by a Norse settlement. In 1224 Gilbert Murray, Bishop of Caithness, built both the town cathedral—which still exists today—and Dornoch Castle, which he used as his residence. Three hundred years later, a clan feud between the Murrays and the Mackays caused the town to be pillaged and the cathedral and castle to be burned. Dornoch also lays claim to the spot where the last witch in Scotland was burned in 1722 (the town of Fortrose disagrees). Janet Horned was accused of turning her daughter into a pony and riding her to a witches’ coven, where her daughter-pony was shod by the Devil. The castle was rebuilt in the 18th century. Before it became a hotel, it served as a garrison, courthouse, jail, and school. It is well worth paying a few extra pounds to get one of the nicely decorated rooms in the old section with a view of the garden and countryside. Better yet, go for one of the suites. Dornoch is 45 miles north of Inverness on A9. Turn right on A949 toward Dornoch, and continue the few miles into town. The castle is in the center of town. Nearby: pony trekking; golf; swimming; Dornoch Cathedral; Dunrobin Castle; distillery in Tain. 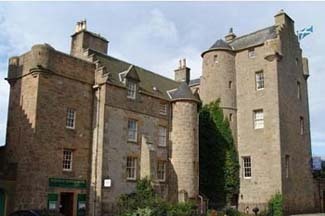 Family-run Dornoch Castle (officially referred to as a “bishop’s palace”) provides an off-beat quality often missing in more luxurious castle hotels. To enter the castle, you step through a turret door and then climb a tiny, winding staircase to reach reception. The tower and staircase are part of the original structure, as are the dungeons, now used ingloriously for storage. Several stairways and labyrinthine corridors lead to the guest rooms, some of which are in a wing built in 1974 and have garden views. Dornoch features two suites: a gorgeous, carved four-poster bed and an open fireplace will keep you warm in the Old Courtroom Suite and a unique king-size sleigh bed will tempt you in the Cathedral View Suite. The original stone-wall kitchen overlooks Dornoch Cathedral and is now the highly regarded dining room where you can indulge in Scottish cuisine. On Saturday evenings in the summer a pipe band parades in the main square in front of the castle. The Royal Dornoch Golf Club—where golf was first played in 1616 and which now rates as one of the top courses in the world—is a five-minute walk from the hotel.